About to graduate with a degree in transportation design, this sure would been helpful. "William Clay Ford, Sr. passed away earlier this month, now Ford has announced that the name and design legacy of Henry Ford's grandson will live on in the form of scholarships for the next generation of minds conceiving the future of transport. 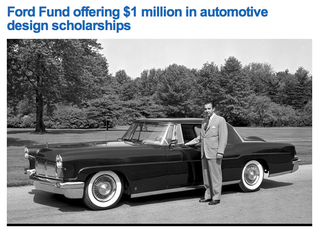 For the next 20 years, the $1 Million William Clay Ford Automotive Design Scholarship will award $10,000 each year to five college sophomores and juniors working toward degrees in automotive design." Well, any aspiring designers around here take note.